Little Baby New Year came into the world on January 1st at midnight this year, just like all of his previous siblings did in the past. His birth refreshes thoughts of the future and what it will bring. The long road of 2011 is in front of us… where will it take us? The 99 Switchbacks to Whitney. Photo by Casey Schreiner and used with permission. I figure if I’m ever going to summit the tallest mountain in the lower 48 states, this is the year to do it. I’m in the best shape I’ve been in a while and I’m still under the spell of the hiking lifestyle. However, I’m not in physically fit enough to confidently say that I can accomplishing this goal. It’s going to take a lot of work to get to the fitness level necessary to climb 14,500 feet into the sky. Plus, I’ve had problems hiking at high altitudes that have caused me to retreat to lower altitudes. This goal will require months of cardio work, muscle development, and trail thumping. It’s gonna be Rocky-training-in-Russia-to-face-Draco kind of work. 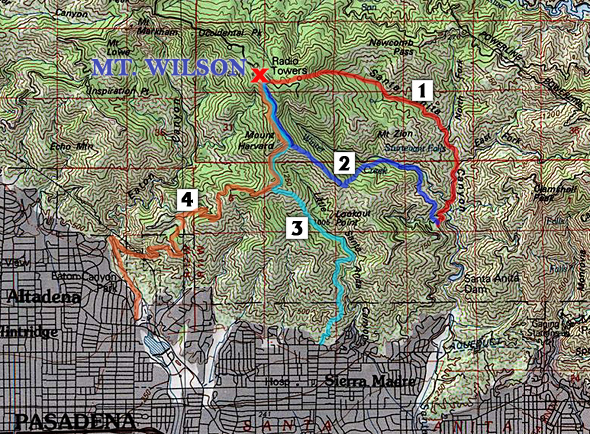 The four main routes to Mt. Wilson. According to the Sierra Club, there are five routes to the summit of Mt. Wilson. Well, four really. The first route listed on the Sierra Club’s website says to drive up the Angeles Crest Highway, park at the Mt. Wilson Park, then simply walk the one hundred or so yards to the highest accessible point. I suppose they provided this “route” because of this unique option that requires almost no hiking to summit it’s peak. So why do I chose Mt. Wilson, which has been developed for over a century and is home of a forest of broadcasting towers and the famous Mt. Wilson Observatory when I could aim to hike other less-developed peaks in the area? I’ve lived in the Pasadena area for almost a decade and I’ve never hiked to the top of Mt. Wilson. The fact that there are a handful of hiking routes to the summit, all of which climb through the beautiful foothills of the San Gabriel Mountains, and all within a short drive of my home, make Mt. Wilson an excellent location for training. I have asked two hiking companions to join me on this quest for bagging Whitney’s peak. Sharon has been a good friend for many years and has helped inspire and motivate me to complete my previous hiking goals. She has joined me for quite a few explorations into the local mountains and is currently working on her resolution of completing this year’s Los Angeles Marathon – it will be her first! Michael and I met on one of my hiking club outings last year where he told me of his aspirations of climbing Whitney. All three of us have sat down together and worked out our “game plan” to prepare for Whitney. We have decided to go on most, if not all, of the following climbs together. Half Dome (Yosemite National Park) – 4,737 ft (1,444 m) – With all the hiking I’ve done in California since moving here in 1985, it surprises people when I tell them that the last time I was in Yosemite was over 20 years ago when I was just a boy. Don’t get me wrong. The reason why I haven’t been back isn’t because I don’t care to see Yosemite again, but rather that California offers so many other outdoor options which are less crowded and do not require reservations six months in advance. But we’re determined to do this classic world-renown hike and are ready to set the dates and acquire the necessary permits. Mt. San Antonio (“Mt. Baldy”) -10,068 ft (3,069 m) – This Southern California peak is a popular destination for many hikers in training for Whitney. San Gorgonio Mountain (“Old Greyback”) – 11,503 ft (3,506 m) – The tallest peak in Southern California and my nemisis. I’ve attempted to climb this giant three times, the first two treks I had to turn back after succumbing to altitude sickness (once with just a few hundred yards remaining to the summit). The last attempt ended abruptly with an emergency departure from the mountain. But, you know what they say, fourth time’s a charm! 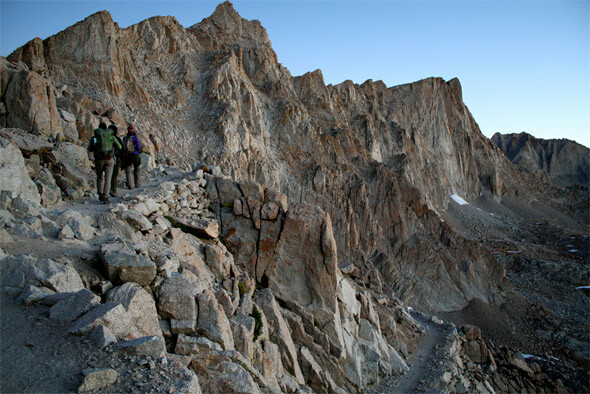 Kearsarge Pass (into Kings Canyon National Park) – 11,760 ft (3,584 m) – Located just north of Mt. Whitney in the Eastern Sierras, Kearsarge is the back door into Kings Canyon National Park. I stood at this pass in August, 2009 for Hike #42 and felt as if I was looking into Paradise. For this trip, we’ll hike into Kings Canyon NP and camp amongst the natural beauty. 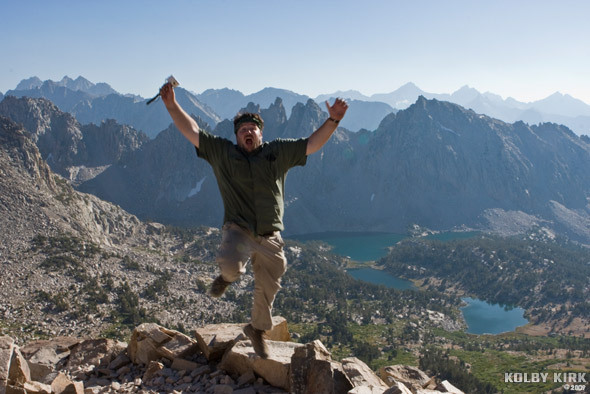 Jumping for joy at Kearsarge Pass; Kings Canyon National Park in the background. We are all pretty excited to work towards this goal together and I suspect you’ll read a lot about our progress on this website. Goal #4 – Hike With 150 People. I started this goal in 2010 but was not able to finish it by the end of the year, so I’m going to keep going until I get 150 people into the outdoors and onto the trail. After 150, I might just keep going. Hiking is a passion and I want to share it with others. If you would like to hike with me, please join my Facebook group, The Hike Guy’s Hiking Club. Last year, I completed training as a reforestation supervisor with Tree People and a naturalist with the Santa Monica Mountains Recreation and Conservation Authority. This year, I resolve to continue giving my time and energy to these two great organizations. My goal is 100 hours of service between the two. So there they are, laid out on the table. No turning back now! I’ll be blogging about my progress throughout the year and, hopefully, by the time Baby 2011 becomes an old man, I’ll be able to report back here with the successful completion of these five goals. I’m full of doubt but ready for a good challenge… and that’s exactly where I like to be in January.